Bajaj Auto ltd. is planning to inject some life into it’s 100cc commuter bike offerings by launching the updated Bajaj Platina very soon. Even though Bajaj Auto stated that the manufacturer will not be aggressive in the 100cc commuter segment, the company also mentioned that it will keep its existing models in the segment afloat. Keeping this in mind the company will launch an updated version of it’s commuter bike with the changes being strictly cosmetic with new decals, stickers and changes to the body panels. 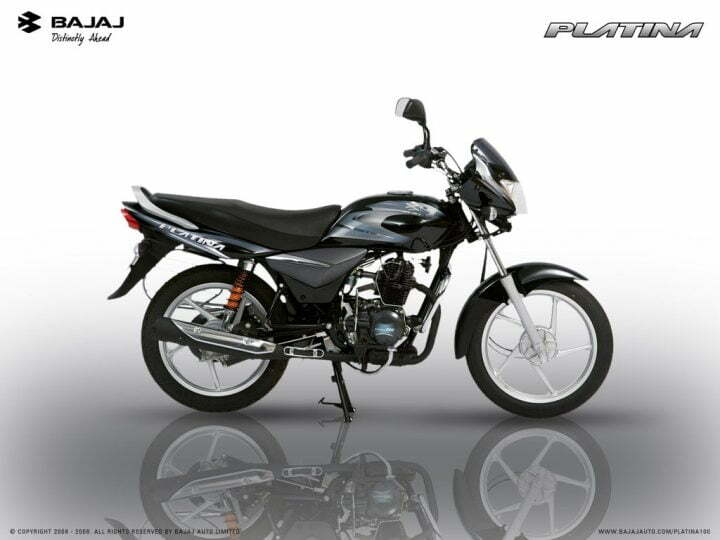 The pricing for the Bajaj Platina will remain unchanged and the two variants on offer will cost Rs. 37,044 and Rs. 39,030 (ex-showroom Delhi) respectively. The 99.27cc, 4 stroke, air cooled ExhausTec engine seen on the current bike will continue to power the updated Bajaj Platina. The engine puts out 8 BHP of power at 7500 RPM and 8.5 Nm of torque at 4500 RPM and is mated to a 4-speed gearbox. The base version gets the standard spoke wheels while the slightly more expensive variant gets alloy wheels. Both variants come with drum brakes as standard. The Hero Splendor rules the roost currently in the 100cc motorcycle segment in India with average sales of 1,80,000 a month which is miles ahead of the Platina’s average of 35,000 a month. With the launch of the updated Bajaj Platina the company cannot hope to match the Splendor’s sales but will try to pull some prospective buyers away from Hero and into it’s showroom.